Joaquin Guzman Loera is the CEO of the Sinaloa Cartel in Mexico. 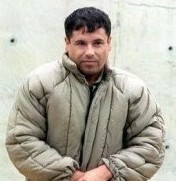 Joaquin Guzman Loera, Alias El Chapo Guzman, is one of the most wanted men in the world. The reward being offered is 5 million dollars for information leading to his capture. He has institutions between institutions that smuggle drugs into now more than three countries world wide, including the U.S., and Europe. His drug dealing and drug revenues of his smuggling operations exceeds 3 billion dollars annually. If you would like to know more information and full documentary stay connected to WWW.MTVIEWMIRROR.COM for more information I would provide in the following week. OH AND DONT FORGET TO COMMENT !!!!!!!! Thanks for keeping us informed. I learned a lot from your post.